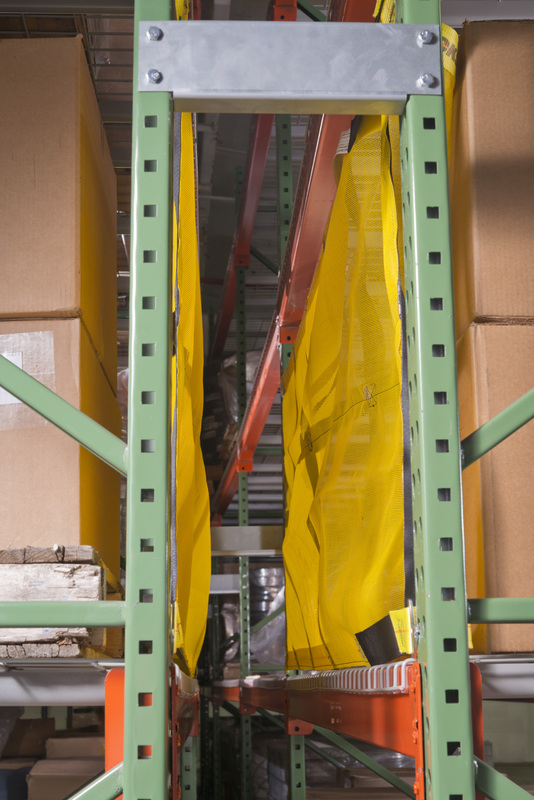 As you probably already know, it’s extremely important to maintain a clear flue space in your pallet racking. According to the National Fire Protection Association, the longitudinal flue space must remain clear at all times with a 6″ separation between racks in the down-aisle direction. While a clear transverse flue space is also important, the longitudinal flue space allows heat from a fire to vent upward and ceiling fire sprinklers to work effectively. It’s simple enough to say the flue space needs to be kept clear, but it can be more challenging in practice when you have many tall racks to maintain. One way that pallet racking flue space can become blocked is by poor rack design. Be certain that your pallets and loads are the right size and depth to fit the racks properly. A well-designed rack system will allow adequate flue space both longitudinally and transversely. Another potential problem for flue space blockage comes from overly deep pallet loads. If your pallet loads are deeper than your racks, pallet push through into the flue space can occur, blocking the longitudinal flue space. If you are storing loose items, these can fall into the flue space and are typically difficult to retrieve and result in lost product. Loading error can also cause pallet push through – even if your racks are the correct size for your loads, pushing the pallets too far back can also block the longitudinal flue space, increasing the risk of fire spread and lost product. First, make sure that your pallet racks are designed properly for your loads and double check that the pallets you use fit on the racks without blocking the flue space. Once you’re sure your equipment is all compatible, it’s time to prevent pallet push through. Luckily, this problem is easy to solve with a great safety solution. While some warehouses install an extra beam to the back of each bay, this solution limits the size of pallets you can put on the rack and can be very difficult to change or replace in case of damage. One of the most efficient and affordable solutions available is a Rack Safety Strap. These straps attach to the back of each bay and have some give to them, allowing the driver loading the pallets to feel when the pallet has been pushed back far enough without causing damage to the rack. They serve a different purpose than a backstop beam, and allow some slight movement into the flue space as objects on the bay are moved, but not so much that the flue space is blocked and out of compliance. 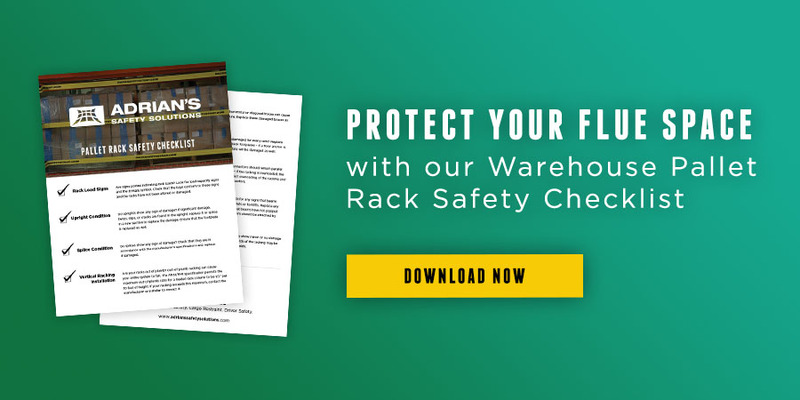 Rack Safety Straps are also just as effective as other safety netting solutions at preventing push-through, especially when dealing with palletized stock. If you need additional safety from loose items within bays that are not palletized and may fall into a work area or into the flue space, Rack Safety Nets perform the same function as Rack Safety Straps with the added protection of a net that covers the entire rear or front bay, depending on your application. Keeping your flue space clear is extremely important – and the right safety solutions make it simple, affordable, and safe for your products and employees.